I am passionate about making a difference. It can be the simplest things that can make a big impact. Here is one baby step to make a difference for people who are sacrificing for us and our country. The program Cell phones for Soldiers takes donations of used cell phones and sells them to fund phone cards for our people serving our country. Not only are you keeping items out of landfills, you are recycling your cell phones for a great cause. Check out www.cellphonesforsoldiers.com to learn where to send the phones and more. Happy Independence Day! When asked to give advice to newlyweds, I always answer to include a weekly Date Night in their activities. Daily life takes it toll on relationships, when conversations about finances, kids and work can take priority over relationships. Date night is one evening (or day) once a week spent having fun with your spouse. It is a time to connect on different levels, including communicating about what you are thinking about as well as making plans for the future. It is also the time to renew the fun you had when you began your relationship. Date night does not have to be expensive or elegant. It can be a dinner and movie in or out, ice cream at Sonic, a trip to a museum or zoo, or whatever simple activity you both enjoy. Date night keeps communication and fun in your most important partnership. This is just another way your planner help you prioritize and empower our relationships. JQ and my favorite date night is dinner and a movie. What is your’s? Has “clutter-it is” taken over at your home or office? Is every flat surface obscured by paper or belongings? My favorite Peter Walsh statement is about the cost of clutter. Peter Walsh has a way of saying this in his book Enough Already. Clutter is demanding, it robs us of space. It promises everything, delivers nothing, and eventually stresses you out. Clutter costs us peace of mind and drains us of positive energy. Imagine what you could do with the time and space your clutter is currently taking up! Choose 15 minutes to declutter your home every day. You can do anything for 15 minutes! Take a few minutes to get items back where they belong in their homes. If items do not have a home, decide if you will “use them or lose them” being ready to store, donate or toss. This routine will get your home or office back to running order very quickly. Choose 5 items to declutter. What do you truly love, truly use and truly need access? Walk around your home and think about items you truly have not used in YEARS! Do this once a week, and with this baby step, your living and working space will evolve into a clear space. Declutter your mind with lists. Use paper and pencil to clear out all those required activities, last minutes errands, purchases and more. Keep paper and pencil in your car, by your bed and by each telephone. If you always have access to paper, it is easier to make a list! Do you have “virtual clutter” – email, forwards, or spam? Eliminate this clutter by using the spam filter provided by your service provider. Hit the delete key for unwanted emails as soon as they arrive. Add a note to your signature line on your email stating “Please do not forward unnecessary email or chain letters to this me. Thank you.” Junk mail and junk email are the same – toss these as soon as these arrive in your box! Stop clutter before it begins! Before you purchase any item, evaluate how and when will you use it, where will you store it, and whether or not you truly love it! What is clutter costing you? Has it cost you too much already? Office life tends to be very messy. We have so much going on all the time! We have so much paper and stuff. It all becomes disorganized very quickly. When do we have time to get organized? In his book, 7 Habits of Highly Effective People, Stephen Covey tells the story of a woodcutter. A man was walking in a forest one day, and he met a woodcutter hard at work sawing down a tree. It was a hot day, and he stopped and engaged in some friendly banter with the woodcutter about the weather and such. The man continued on his way and a couple of hours later as he came back through the forest he came upon the woodcutter again who was still hard at and sweating profusely from the heat and his efforts. He asked, “Mr. Woodcutter, how long have you been sawing that tree? You haven’t made much progress. Perhaps your saw is too blunt. Why don’t you sharpen it?” “I could” the woodcutter sighed. “The saw has not been sharpened for a long while. But I don’t really have the time.” We have to sharpen our ax too! With organizing we are more efficient, effective and productive! What can we do in 15 minutes? Eliminate unnecessary paper from a completed project. Set up a file for the current project. Get papers back into their files. Organize your top right drawer where your office supplies are. Is it overcrowded with unused items? Return them, donate them, or share them with co-workers. Make a group of all the items that need returning to others in the office and take them to them. Gather your daily resources, such as company phone directories, directions for using products, or other work related items together and place them on an easy to access shelf. Gather all your personal memorabilia and assess the quantity. Are there too many family photos, small wind up toys, or other items taking space on your desk? Delete emails from your “Sent” folder. Delete subfolders in your Inbox. Return a phone call or make personal appointments for hair, nails or doctors. Review your calendar for upcoming appointments. Enter upcoming dates into your calendar. Add to your master list. 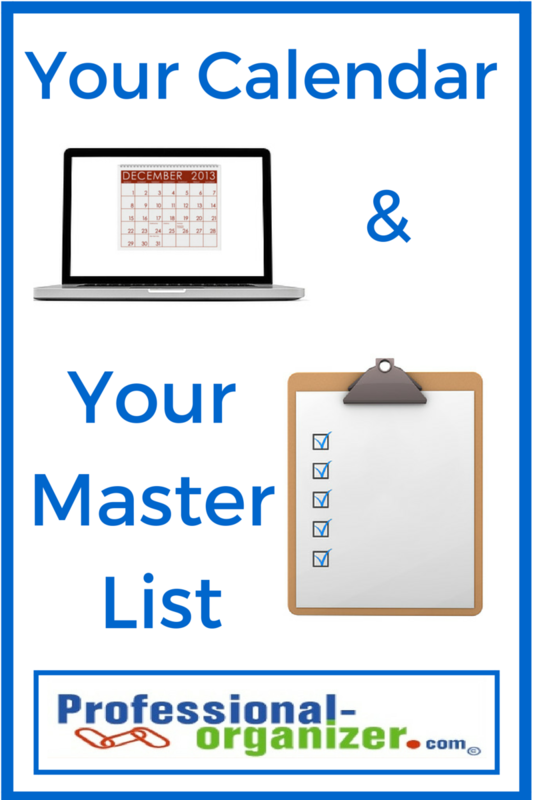 Review and prioritize your master list. End your day with 15 minutes of organizing, getting things back into order. What are you doing with your 15 minutes of office organizing? 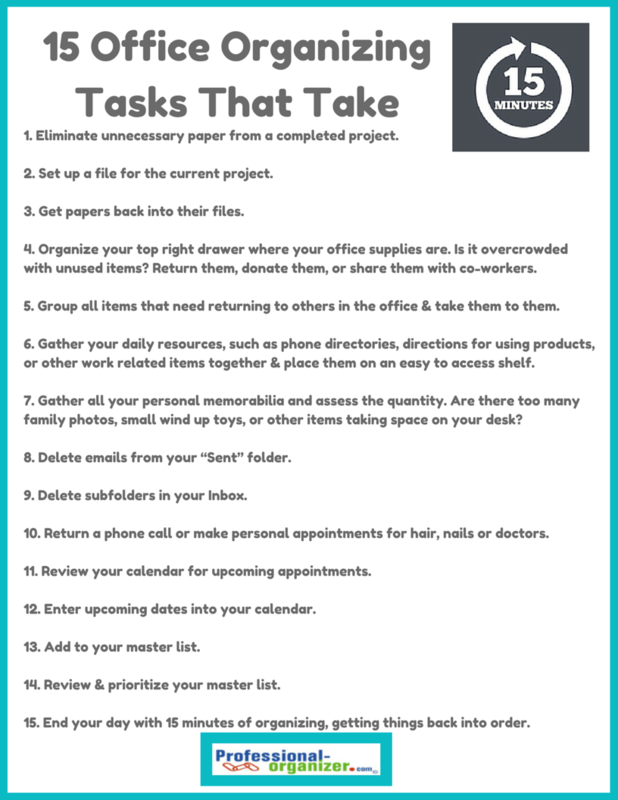 Want more ideas on office organizing and productivity? Join my newsletter! For most of us, we seldom have hours and hours to get organized. Here are some baby step 15 minute organizing ideas for our homes. Just 15 minutes of home organizing makes for easy home maintenance. See what 15 minute project you want to start with and comment on how much you accomplished! Ready, set, go! Check out those toiletries, body lotions and cosmetics! Toss what is empty, consolidate what is half empty and categorize the items by their use. Keep extra bottles of each item to the back of the area. Place in the front, in a portable container, what you will use each day. Toss expired medications and over the counter remedies. Do you have allergy medicine, cough drops or other over the counter items for use in the middle of the night just in case? Make a list of what you will need for your next trip to the store! Group together the medicines for each type of illness, from stomach to sinus. Can’t find what you need to make dinner each evening? Group together the veggies, then the fruits, and finally pasta. Line up your can goods together just like the grocery store. Keep what you use most frequently on the middle shelf in easy reach. On the bottom shelf, group drinks and snacks for your children to serve themselves. Overwhelmed by paper? Use 15 minute segments to make decisions about your piles. Your options are “toss”, “to do”, or “keep/file”. Make quick decisions about toss by referring to these options – anything out of date, any duplicates, or anything you can find on the Internet. With your “to do” pile, generate a list to be incorporated in your calendar. For your “keep/file” papers, jot the category on a post it note and stick this to the paper. It will be ready to create files at a later time. Here is a challenge! Spend 15 minutes every day for a week in your closet! Starting on the left side of your closet, go piece by piece and decide what to keep! Keep only what you love and what will fit you currently. Donate clothes that are still in good condition, toss what is stained, missing a button or torn. Make a list of your donation items and calculate your tax deduction using “Its Deductible”. Once you have reviewed all your clothes, re-arrange them by categories of slacks, shorts, blouses, skirts and dresses. Within these categories, arrange the items by the length of the items and then color. An extra special visual touch is to use one type of hanger for your clothes! Hangers with a swivel metal head and clear plastic body with clips or without make your closet look like a fashionable shop! Have your family team participate with you in organizing for that 15 minutes! It is more fun, gets more done, and adds to family cohesion. You can play beat the clock by setting the kitchen timer for 15 minutes. You can assign tasks to 2 family members so you work in pairs to get trash out, laundry put away, or dinner dishes done. See who can put away the most items in 15 minutes. Don’t we all want to have fun and get the job done? Let me know what works for your 15 minutes of organizing! 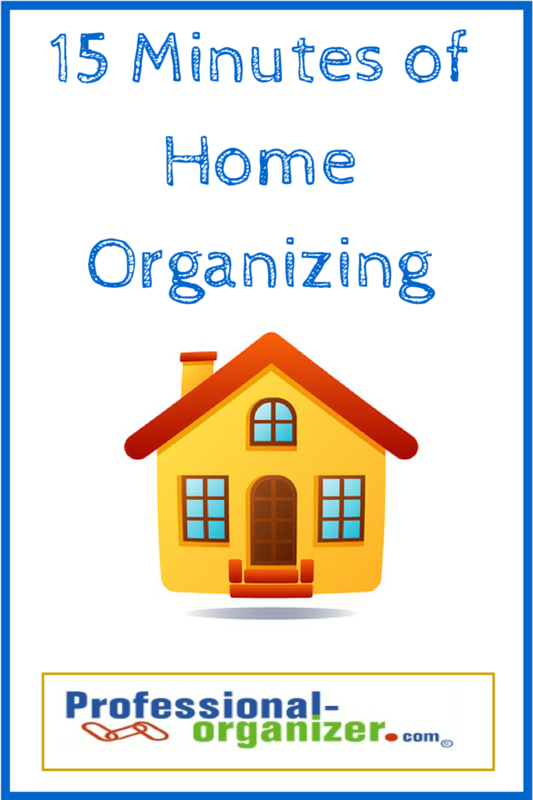 Home organizing challenges? Join my newsletter! Organizing can be a lonely, isolated job. Working by yourself, you may not be motivated, make decisions or even get started. Many times my clients voice that they just don’t work well alone. I love the idea of a clutter buddy or paper partner because organizing happens this way! A clutter buddy is a trusted, non – judgmental buddy who is there while you are organizing your stuff. A paper partner does this job while sifting through the paper piles. These are people who offer no opinion but may offer options, who do not cloud your decision but help you reflect, and who are there to help you focus on the task at hand. Finding a partner is the antidote to procrastination. First identify what is getting you stuck. Is it being overwhelmed and need someone to externally process with? Is it a skill set and you need someone who thoroughly knows this skill? Is it an enthusiastic affirmer who keeps you on task? It is powerful to know what you need and find the partner that helps you power through the rough spots! Partnering can take many different forms. One way is to use your cell phone to chat with a friend while doing a task. Whether it is sorting paper or emptying the dishwasher, this can get the task accomplished. Another way is being together in a new space. Coming together for coffee, both partners might bring their paperwork to simultaneously write bills. Organizing can get done and then it is sharing what organizing jobs you accomplished each day or week. What are your creative ways to partner? Who is your clutter buddy? Creating a happy, organized home helps each family member be the best they can be! By building a cohesive family team, you are affirming all of the family members and nurturing yourself and them. For several years I have been a fan of the Family Manager program and Kathy Peel. The program emphasizes a fresh perspective on your home and life. And sometimes this new perspective makes all the difference for your family! As a Certified Family Manager I help people review what is going on in their homes and lives as if it were a business. Your home is viewed from the perspective of 7 different “departments”, including home and property, food, special events, time and scheduling, finances, personal management and family and friends. A family manager uses the same skills and strategies of team building, delegating, and standard operating procedures as a business would. By knowing what our job is, “managing” each department, knowing our mission and communicating well, we empower ourselves and our family. Learn more about family manager at www.familymanager.com. Kathy’s book, A Busy Mom’s Guide to a Happy, Organized Home, tells all about this system and more! Your kids will remember all your family celebrations and traditions. Birthdays, confirmations, Mother’s Day, and Father’s Day are events that bring your family a special joy of celebrating a person. Holidays like July 4th celebrate family values like patriotism. Holiday traditions like Christmas, Hanukkah and Kwanzaa celebrate spirituality. Precious family memories are formed this way. All family events require planning and execution. Keeping your plans simple and including the family team in the execution make family celebrations joyful. 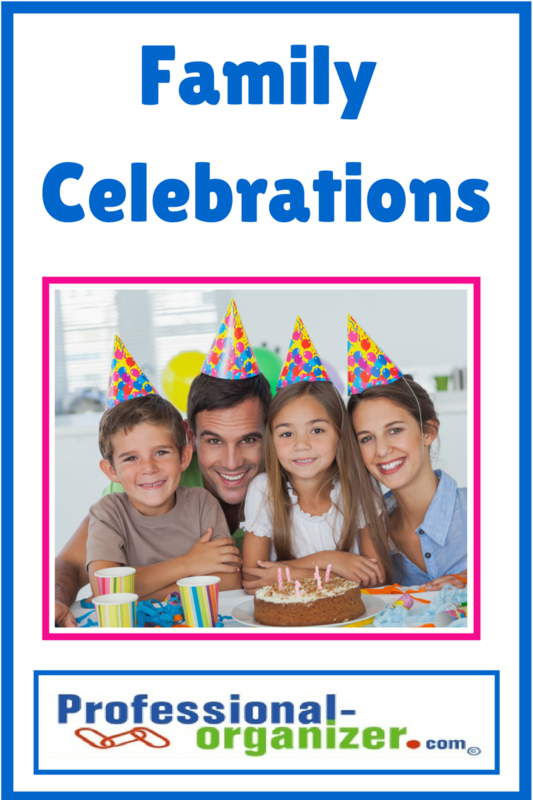 Brainstorm with your family which events to celebrate including birthdays. Mark your calendar for these events on both your personal and family meeting calendar. Create a list for the event including invitations and purchases. Develop a time line for invitations, purchases, and preparing your home and food. Can you delegate to your team members according to their strengths? Can you kids address invitations? Can your spouse do the food shopping? Make family time more manageable. As the event comes closer, break the jobs into small chunks. Manageable pieces, like setting the table, decorating, and cleaning one room at a time, can make the event less overwhelming. Get a good nights rest the evening before the event. All families require energy to be flexible and enthusiastic. Welcome the fun of a family celebration, regardless of what goes awry! Sharing in family events is about the time together! Don’t worry about it being perfect. Focus on the happy times. There are many systems to help you with time management. I have found that this comes down to integrating two parts, your calendar and your list. We all have so much to accomplish and we all want to be productive. Try this and see if it works for you! How do these come together? Not surprisingly your weekly planning time combines these two tools. Take time each week to review your list and place tasks on your calendar. This way all priorities are covered. You can consolidate tasks too, like phone calls and emails. Your weekly planning is a time on your calendar too! Join my newsletter for more ideas on planning and list making. Simplicity makes a difference in all our lives. Creating a simple plan, working on a simplified project, and communicating simply are all important aspects of simplying our lives. 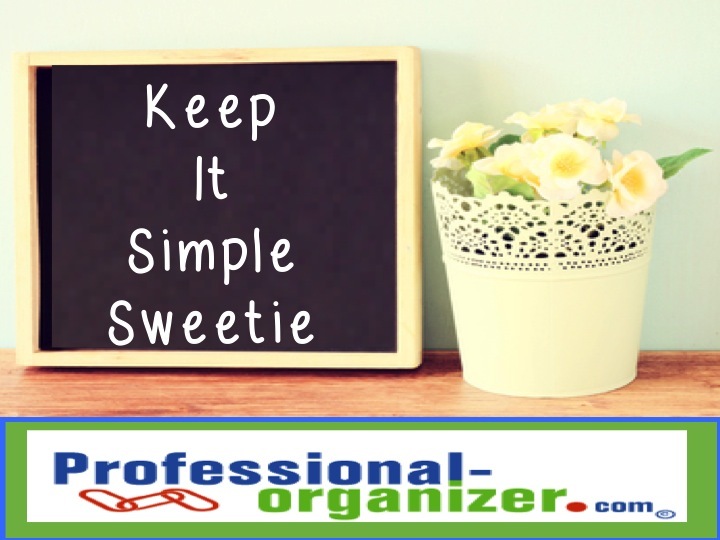 I love the mantra of Keep It Simple Sweetie because it reminds us in a fun way to keep things as simple as possible. Often complexity makes a task overwhelming and paralyzing. The details become the project instead of the outcome. Think of the tasks to accomplish, whether for home or work, and see what the most direct path to accomplish that can be. Start with the end in mind. What do you want to accomplish and what is the deadline? What is the path to accomplish the goal? Ask for help from your team, whether it is your family or co-workers. A team effort makes the work more fun, gets the job done quickly and lessens your work load. Stay on task for completion. Keep off those bunny trails. If you are easily distracted, create reminders to keep going and get it done. Remember that done is perfect! Balance your perfectionism with the time allotted to get the job done. Simple steps for your work at home or elsewhere create effectiveness and efficiency. Your benefit is your great sense of productivity for accomplishments! And you get to do the really fun stuff now!